Great Bards of QbD: Dr Seuss? There are not many poets associated with QbD, so this next one is a bit of a stretch to include in the series. The technical QbD contribution comes from Dr Art Etchells, the outstanding fluid mixing consultant who had a long and distinguished career at DuPont and now teaches and consults more widely. For an example of Art's work, see his chapter on pipeline mixing in the Handbook of Industrial Mixing. Anyone designing flow chemistry systems will find this material useful and we are building related tools for our users. The rhymes and philosophical contribution are from Dr Seuss, to whom I was introduced by Art [tenuous connection - Ed] while walking in downtown Philadelphia about 10 years ago. I was looking for books for my daughter and being European had not heard much about Dr Seuss. After Art's introduction, we never looked back and my daughter went on to read early and well. I was struck by the quality of the writing and still pick up the books today, while she has outgrown them. 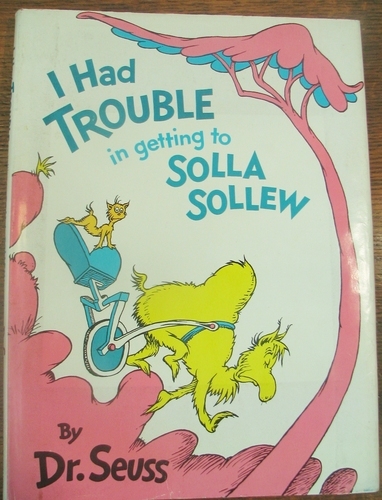 One in particular seems to encapsulate much of the QbD journey: I Had Trouble in Getting to Solla Sollew (aka The Desired State). You can buy the book at Amazon, for example - I recommend it for any age. In the tip of my tail! By aiming my eyeballs in different directions. Both behind and in front. And now I was really in trouble, you know. Our camel now needed a camel physician. Back in the real world, there are more than two hundred of those 'bats' in DynoChem Resources. You can hear all about them from our customers at the DynoChem 2011 Meetings in Mumbai, Chicago and London.